Schmeichel (4.5) has been an absolute fantasy delight in the past couple of weeks, with 5 clean sheets in his last 6 games, to send the Foxes way clear out of the relegation zone after spending the better part of the season at the bottom spot. A final home game against now bottom placed QPR should be no trouble for the in-form keeper. Alternatives: West Brom’s budget keeper Myhill (4.1) has been a fantasy revelation of sorts after keeping 4 clean sheets in his last 5 games, that too against the likes of Chelsea, ManUtd and Liverpool. Though they take on Arsenal on the road this week, there is a decent possibility of holding them to a 0-0 draw like Sunderland last week. Leicester’s Wasilewski (3.9) and Villa’s Vlaar (4.3) are our first two picks in defence as they take on the bottom two in favorable home fixtures. Though Villa haven’t been in the best of form defensively, they come up against a struggling Burnley side, that has managed to score just one goal in their last 8 games. Next up are Smalling (5.3) and Koscielny (6.1) who face slightly trickier opposition on the last day. Though United haven’t seen results go their way lately, they were decent at the back against Arsenal last week, and should be able to shut out a battling Hull side, who have scored just once in their last 3 games. Finally, Terry (7.0) and company will be looking to end the season on a high, and will be raring to get a final victory in front of the home faithful, before lifting the cup on Sunday evening. We expect a clean sheet here too as they take on Sunderland, who will be comparatively relaxed after managing to beat the drop last week. Alternatives: West Brom’s Dawson (4.5) and Sunderland’s Van Aanholt (4.1) have been in fine form in the last couple of weeks, and might just be able to hold off the London giants to a draw. With Hazard set to miss out on the last day with some dental infection concerns, we thought of featuring a nice differential option this week. Young (5.0) has been an absolute revelation under Van Gaal, and has claimed the left flank for his own with some superb displays this season. The winger has finally managed to convert his form into fantasy points recently, with 1 goal and 5 assists in his last 6 games. Silva (9.8), Puncheon (5.5) and Mane (6.2) have all been in top form recently, with a bunch of goals and assists to their name in the past couple of weeks. All three are the focal points in attack for their respective teams, and will be looking to score / create some goals on the final day of the season. Sanchez (11.6) picks up the final spot in midfield, in spite of drawing blanks in his last 3 games. The Chilean seems to be in a slump of sorts lately, but we are more than confident that he will end the season on a high. Alternatives: Liverpool’s Henderson (6.6) and Swansea’s Sigurdsson (6.5) are two decent alternative options to consider in midfield this week. 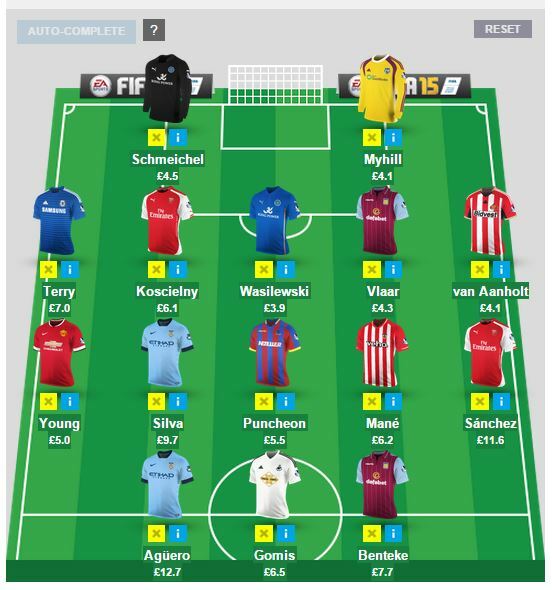 With the Golden boot all but secured, Aguero (12.9) is our first pick to lead up front. The in-form striker has been on a goal scoring rampage since their Derby loss, with 8 goals and 3 assists in his last 6 games. The Argentine will come up against a defensively shabby Saints side this week, who have shipped 9 goals in their last 5 games. Speaking of goal rampages, Benteke (7.7) isn’t too far behind himself, with 7 goals in his last 6 games for the Villans. Though they face off against an already relegated Burnley side, we feel he will play no more than 60mins, as Sherwood will want to rest his star striker before their FA cup final clash against Arsenal next weekend. Finally, the inform Gomis (6.5) earns the last spot in our squad, after netting an impressive 5 goals in 5 games for the Swans. Alternatives: Manchester United’s skipper Rooney (10.6) will return from injury this week, and is a nice differential option to consider. Everton’s Lukaku (8.7) is another excellent option to consider, seeing his recent tally of 2 goals in 3 games. This entry was posted in General, Squad and tagged EPL, Fantasy Football, fantasy premier league, Fantasy Squad, Fantasy transfers, FPL, Gameweek 38, GW38. Bookmark the permalink.